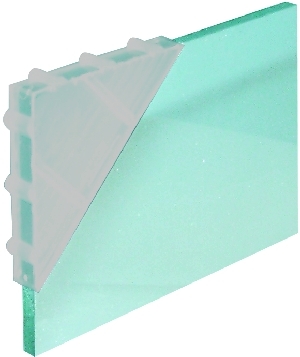 Corner Covers for 8 - 10 mm glass. These Vinyl Corner Covers are designed to protect mirror and glass edges during shipping, handling or storing. These Vinyl Corner Covers are designed to protect mirror and glass edges during shipping, handling or storing. These Edge Protector Covers for 8 mm glass thickness, made of soft vinyl, will not scratch or damage mirror or glass surfaces. They help protect large cutoffs from breakage or becoming scrap. Vinyl Corners are re-usable, and simply slide on and off. Packaged 100 covers per bag.